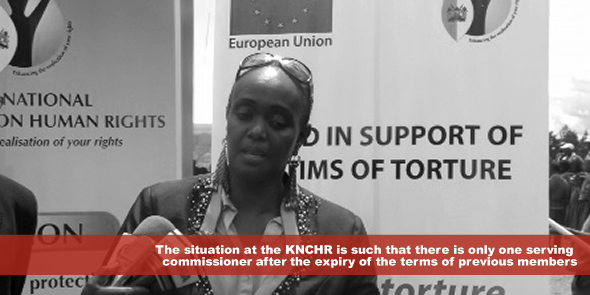 The situation at the KNCHR is such that there is only one serving commissioner after the expiry of the terms of previous members. Consequently, the same commissioner is also acting as the chairperson of the Commission and effectively performing the functions of five people. The practice, with the appointment process, has been such that the terms of the past commissioners have been staggered to allow for continuity. Understandably, some of the former commissioners’ terms ended shortly before or after the 2013 elections, and the expectation would be that the selection of new commissioners is something the present government would embark on to ensure the commission is run accordingly. However, in the wake of a new government, this has not been the case. Several advertisements have been placed in the Kenya Gazette and to some extend candidates have been shortlisted, but no appointment has been made as envisioned by the Act. The argument here is that the Commission, being run by a single member, falls foul of the Paris Principles, the Act and, by extension, the Constitution. Furthermore, it reeks of non-commitment towards the effective functioning of institutions that promote and protect human rights. Interestingly, the terms of other members of commissions such as the National Cohesion and Integration Commission established in terms of the Constitution, have expired with no word from parliament or the executive. Moreover, if continuity is to be maintained, there is an urgent need to set the recruitment and selection process of new commissioners as soon as possible given that the terms of the current serving commissioners expires in January 2014. The need for pluralism is important as it promotes independence, offers critical guidance to the staff of the commission and results in the better fulfilment of the KNCHR mandate of promoting human rights and developing a human rights culture in Kenya. Francis Khayundi holds a Bachelor of Laws (LLB) from the University of Fort Hare and a Master’s in Law (LLM) from Rhodes University (South Africa). Khayundi is currently a PhD candidate at Rhodes University. His research interests are international human rights and climate change. He has previously worked as a Lecturer (part-time) in the Faculty of Law, Rhodes University. African nations need a workable framework with adequate and consistent public enlightenment and education on their rights,etc. In formation is king,knowledge is light.